While the images I took in the second shoot were much better than shoot 1 in terms of quality, the portrayal of my concept is somewhat lacking. 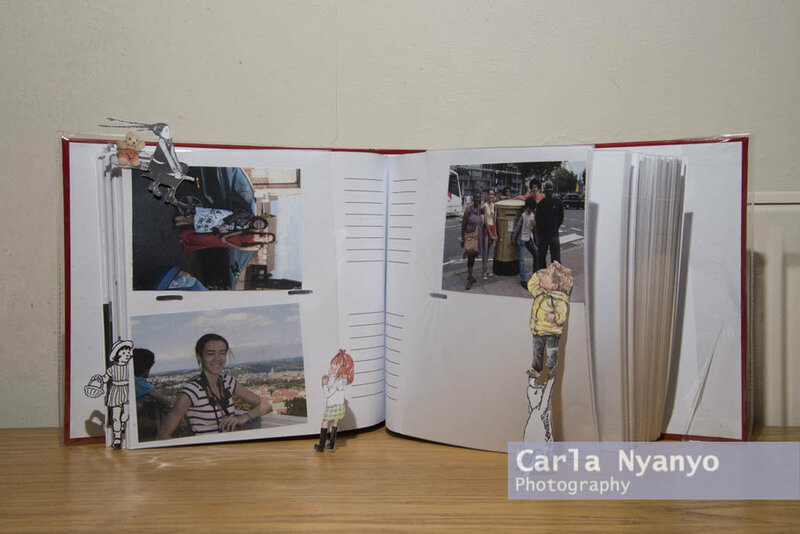 I had discussion with another lecturer and we came up with a solution that lies in the middle of my 2 previous shoots which was to shoot at my house and arrange the characters look through photo albums. At this point in the module I was a week away from the deadline and extremely pressed for time and so I wasn't able to go home and collect family albums and we have rather too many for my mum to send to me. In the end I made do with making my own from images that my mum emailed to me. So this is the final outcome, I'm not crazy about it to be honest. Shooting against the radiator was not the vision I originally had, ideally the background would have been plain but the shelf I wanted to use as my stage wasn't wide enough to support the book once opened so in the end I had to use my desk. I feel that with this shoot I'm closer to achieving what I imagined this piece to be but it's still not quite there. I think that if maybe I'd thought of this idea a week earlier I would have been able to complete this project to the standard I wanted to.